Arrow closes off its fifth season by focusing on Oliver’s final battle with Adrian Chase and bringing an end to the flashbacks. Last week set the stage for the conflict by outlining the stakes and setting up Oliver’s temporary team with the enigmatic cliffhanger showing him asking Slade Wilson for help. The opening scene showing him asking Slade for help was a great showcase of the complicated relationship between these characters. Slade has apparently mellowed in the time he has been incarcerated and has gained some much needed perspective. Much of his rage and desire for revenge was amplified by the Mirakuru. This both works and doesn’t as it suggests that Slade’s desire to tear Oliver apart was as a result of the Mirakuru which makes his motivation almost seem less than genuine. I choose to see it that the feelings he already had were amplified. Slade gaining perspective on everything he has done does make it more believable that he would work with Oliver and allows for a lot of excellent interactions between them. Since Slade is working willingly with him it removes the antagonistic edge to their team-up which makes things more meaningful. Their discussion about Oliver’s past catching up with him is especially fascinating. 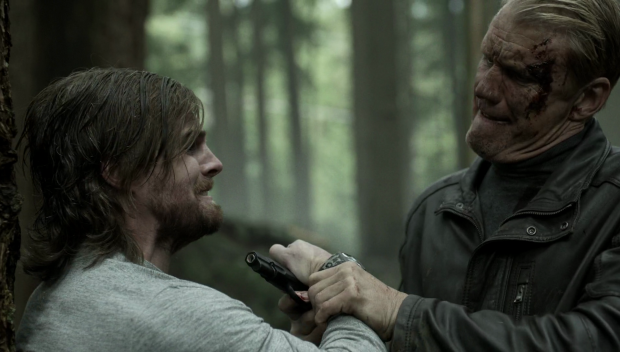 Slade tells Oliver that it keeps happening because he is unable to forgive himself and put it behind him. Oliver has been through a lot but the defining moment for him was his father’s suicide. That one event essentially set everything in motion and Oliver has been trying to live up to that sacrifice ever since. Slade’s point is that he can’t so he has to put it behind him which ties into the overall theme of Oliver finding a new way to define himself. Having Slade around is great because he was there at some of Oliver’s darkest moments while also sharing in some darkness himself so is a good authority on how to deal with that. His renewed perspective allows him to advise Oliver in how to deal with the things that weigh him down. I remember reading a while back that Manu Bennett wouldn’t actually be available to return and the character would appear through a voiceover while the Deathstroke costume was filled by a stuntman. It seems that in some scenes that was what happened as he talks to Oliver with his mask on then takes it off in other scenes. I found it a little jarring to see a conversation where Slade was masked and Oliver wasn’t particularly as there was no reason for Slade to be wearing his mask. Some of the intended emotion didn’t quite get through because Slade’s face was covered. I also found it comical that he pretended to betray Oliver twice. It was fairly obvious that was what was going on and to use it twice in the same episode is an interesting choice. Even more amusing is that it worked twice in one episode. Both of these instances show the camaraderie between Oliver and Slade that has been reawakened as they work together in perfect sync with an unspoken trust between them. Most of the characters featured in this episode had a moment to shine though most of them were fairly brief but that doesn’t diminish their effectiveness. 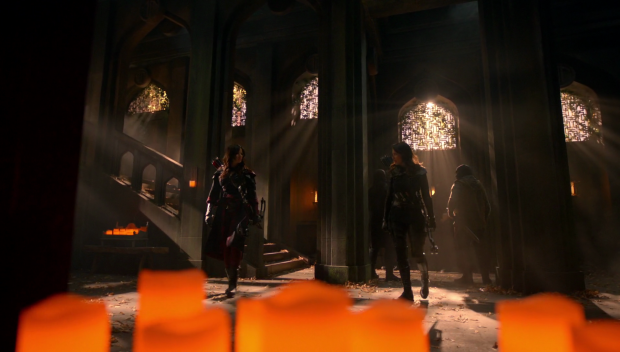 Nyssa got to resolve the conflict she has with her sister that we only really get a sense of in this episode. The result is a really cool fight showcasing expert training with Nyssa quickly gaining the upper hand. Whether it was too quick or not is up for debate but the fact that time was allowed in such a busy episode and to have it turn out as exciting as it did is not something to be ignored. The main difference between them is that Talia defied her father and went her own way where Nyssa stood by him out of loyalty. Their conflict doesn’t go any deeper than that which is a pity because it did seem interesting. Malcolm is allowed a dignified exit when Thea accidentally steps on a landmine and he takes her place. He does so selflessly and against her wishes which shows that despite all the terrible things he has done he genuinely cares about Thea and shows her this in the clearest possible way. She protests because she doesn’t ask for this but Malcolm tells her that a child doesn’t have to ask anything from her father. It’s a touching moment and lends weight to Malcolm’s death. I’m not entirely sure Malcolm is dead because we don’t actually see it happen which is usually a fair indicator that the possibility of a return exists. John Barrowman has said that he won’t be returning next season but I wouldn’t rule out a return somewhere down the line. The fact that he was able to swap places with Thea so easily suggests to me that he could have done the same with Captain Boomerang and escape. Interestingly Malcolm isn’t forgiven just because he had an effective death scene. Thea talks to Felicity about how conflicted she feels since Malcolm did so many awful things to her and those she cares about but she still feels sad about what happened. Felicity is able to relate to this because she had exactly the same experience with her father who had set himself up as someone she could and should hate but took action to protect her anyway. The conclusion is that it’s ok to mourn his passing without forgiving him for what he did. It’s a very complex and adult reaction that comes across really well. Felicity expresses a desire to rekindle her romance with Oliver by kissing him in case she never sees him again and has one more thing to regret. I wouldn’t necessarily want to see that relationship come back and I found the conversation Felicity had with Samantha about it to be less than interesting. Felicity could have had better emotional grounding than this but at least she got to do her tech thing when the occasion called for it along with Curtis who also made a dated reference. Dinah is formally given the title of Black Canary by Quentin as a mark of acceptance. It’s a feel good moment that isn’t fully earned because there wasn’t much in the way of meaningful interaction between these characters. Having her square up against Black Siren was really exciting and Quentin knocking her out to show his acceptance of the fact that she isn’t his daughter was another satisfying moment. Sadly there wasn’t much for Rene to do but he was part of the mix at least. Diggle also managed to be sidelined which makes sense as he didn’t have much of a personal connection to the situation. The episode did feel like it was missing a patented Diggle pep talk but it didn’t bring the narrative down in any major way. Having him relegated into the background does show that the focus was given to the guest characters which is understandable in a way but also does a disservice to Diggle’s status as Oliver’s right hand man. This episode is all about Oliver’s conflict with Adrian who baits him into a situation where killing might be the only way out. That’s the way Adrian sees it but Oliver steadfastly refuses to give Adrian what he wants. This conflict is the culmination of a 10 year journey for Oliver. He started out as a hopeless survivor who became a cold blooded killer and mellowed into someone that could be called a Hero. Even though his own son is in danger he refuses to give Adrian that final satisfaction of dealing the lethal blow. Josh Segarra absolutely nails his performance in this episode. There is sadistic joy to every line that he has and the way he plays Adrian trying to get under Oliver’s skin by constantly taunting him with all the plans he has made to counter actions that Oliver hasn’t even thought of yet is brilliant. This episode really sticks the landing when it comes to Adrian Chase as a villain and numbers him as one of the most memorable antagonists this show has had. It’s a pity that he didn’t get to share a scene with Slade so that they could fight about who was the better bad guy for Oliver. In the end Oliver does beat Adrian on an ideological level. Adrian wants to prove that Oliver is a killer and push him to the point that he might have no option but Oliver doesn’t bite and proves that he has changed for the better. Oliver is no longer the killer he once was and is able to finally prove that to Adrian when he refuses to kill him even when he has a gun to William’s head. 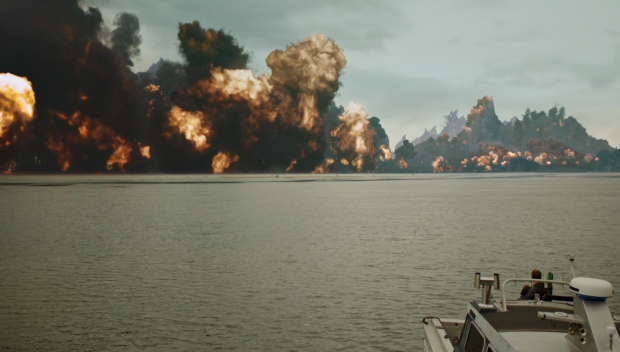 The staging of this scene is great as Adrian forces him away from the island which is rigged to explode if he dies. William is on the boat with him so Oliver essentially has the choice between killing Adrian and losing everyone he cares about -except Roy and perhaps Lyla- or letting William die and saving everyone on the island. He ends up splitting the difference on the choice and shooting Adrian in the foot which does feel a bit anticlimactic as decisions go but it seems to be something that Adrian didn’t anticipate. It’s anticlimactic because it doesn’t really allow Oliver to finally outsmart Adrian nor does Adrian find himself truly beaten but this. It was still a good moment and an impressive piece of improvisation on Oliver’s part but it doesn’t quite land on a thematic level. Adrian’s follow up to this is to admit that he has been beaten and has somewhat misjudged Oliver. It has been proven that Oliver is a good man who feels compassion for those around him. 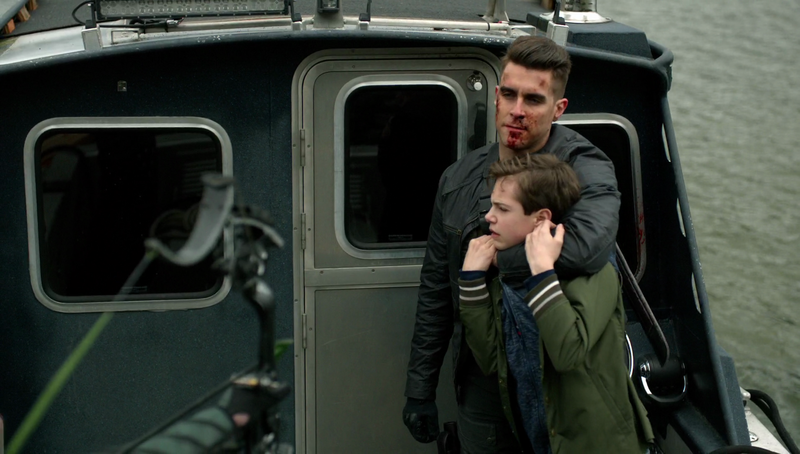 This was proven to Adrian and William at the same time and a comparison is made between Oliver on a boat with his father very near that exact location when Robert Queen killed himself to save Oliver. The key difference here is that father and son get to stay together and Adrian thinks that it’s good that they have each other because they will need one another. On that note he kills himself and triggers a massive explosion on the island seemingly killing everyone on it. It’s a shocking ending and drives home the idea that Arrow is letting go of the island. It essentially isn’t there any more so the show can no longer return to it on any level. To paraphrase the intro to almost every episode, Arrow has become something else. I don’t think for a second that the entirety of Team Arrow will have been killed by the explosion but I also can’t come up with a workable theory as to how they could have survived. It’s possible there will have been some losses but who those are I couldn’t say. All I can say is that the final image of the season depicting the island spectacularly exploding is incredibly memorable and looks great. The flashbacks come to an end this week now that they catch up with the first season. As stories go it couldn’t have been simpler as the bulk of it is Oliver taking down Konstantin Kovar’s forces. The choreography in Oliver’s final conflict with Kovar was excellent and Dolph Lundgren made for a physically intimidating opponent which made it all the more satisfying when Oliver defeated him. After this point we see the rescue as it was shown in the pilot episode but get something extra when we see a phone call between Oliver and his mother. It’s a powerful scene with great acting from Susanna Thompson who successfully conveys a hysterical mother realising that her son is alive after all this time. It was a welcome cameo and closed the book on the flashbacks perfectly. 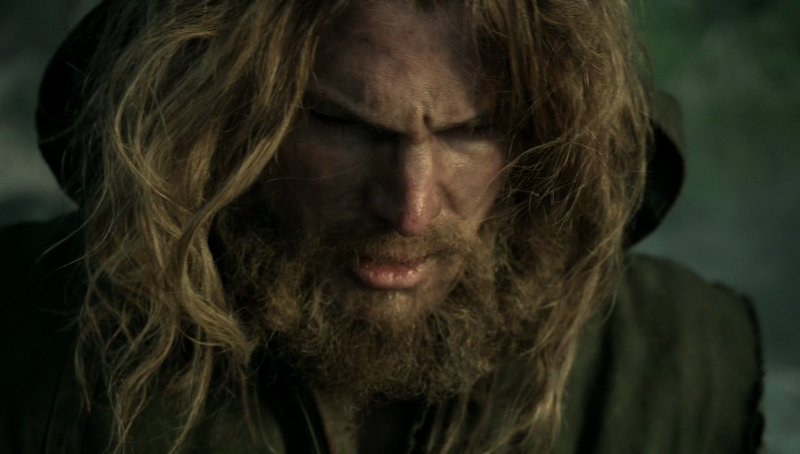 Special attention has to be given to Stephen Amell’s performance in this episode. 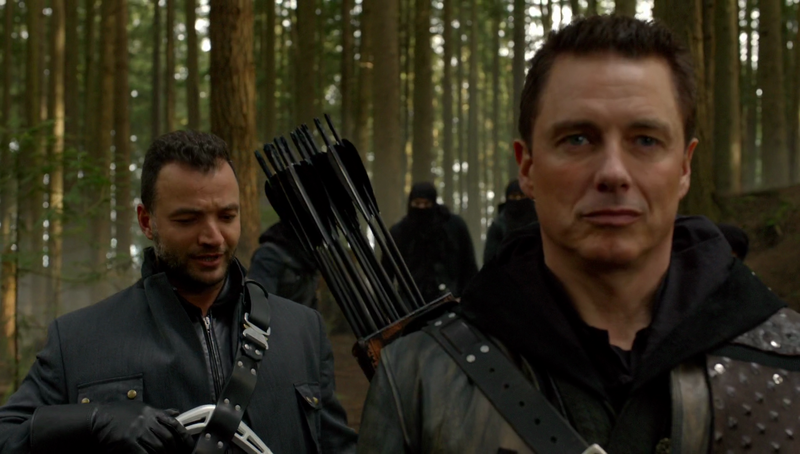 He definitely brought his A-Game for such an important chapter in the enduring mythos that Arrow has built. Amell plays Oliver as confident, desperate, lost and determined in different quantities throughout the episode and nails it every time. The raw emotion he delivers when begging Adrian to tell him where William is was astounding and I have to praise the shell shocked delivery of his lines when he spoke to Moira in the flashbacks. All in all, Stephen Amell showed why he’s leading man material and delivered one of his best performances in the show’s history. An outstanding episode that brings an end to the conflict between Oliver and Adrian Chase while also closing the book on the flashbacks. 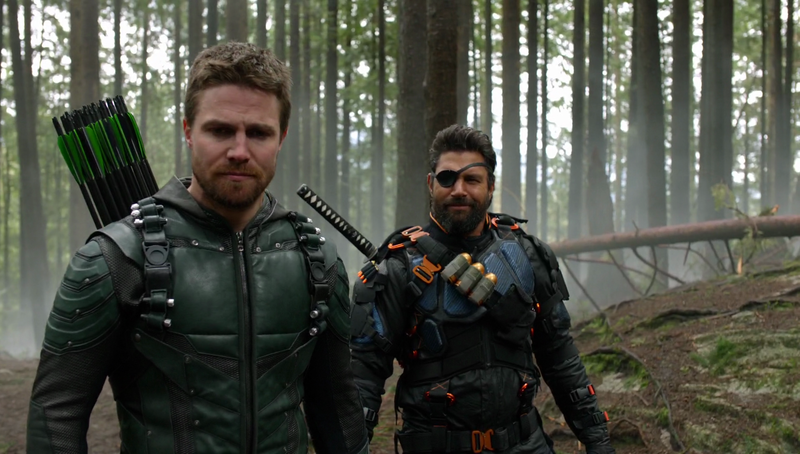 Having Slade Wilson back was welcomed and having him advise Oliver that he needs to forgive himself to truly let go of his past was nicely tied into the overall theme. The fact that his murderous rage has worn off because the Mirakuru has left his system both works and doesn’t. It allows them to work together while removing the antagonistic edge to their relationship but it also suggests that Slade’s mission to tear Oliver’s life apart was less than genuine. Other characters were allowed a moment to shine such as Nyssa defeating Talia after rushing us through the root of their conflict, Malcolm’s dignified death which allows him to show Thea how much he cares while not being completely forgiven even when Thea mourns his loss, Felicity’s desire to rekindler her romance with Oliver, Dinah formally being accepted as the new Black Canary by Quentin as Quentin proves he understands that Black Siren isn’t his daughter. Sadly Diggle and Rene are somewhat sidelined. This episode is all about the conflict between Oliver and Adrian. Oliver manages to defeat him on an ideological level because he proves once and for all that he isn’t the killer that Adrian thinks he is. Even when William has a gun to his head Oliver proves that he isn’t a cold blooded killer any more and Adrian eventually accepts it. The staging of their final moments together is great with everyone Oliver cares about at risk on the island and William at risk on the boat. Adrian compares this to the formative moment in Oliver’s life when his father killed himself to save him and highlights the main difference with father and son being together. After that Adrian kills himself and apparently kills everyone Oliver cares about except William. I’m sure that not everyone will have died but there might be some losses. The flashbacks come to an end this week in a fairly simple plot involving the final conflict between Oliver and Konstantin Kovar who really works as a physical threat. 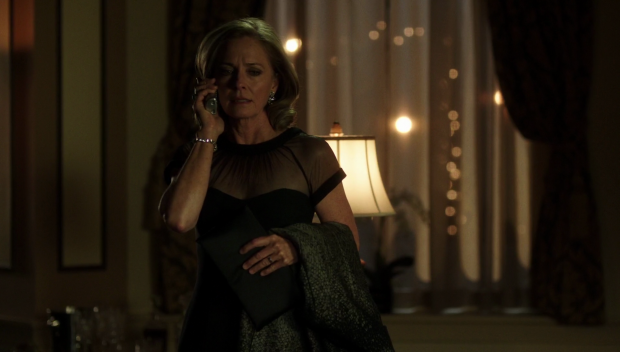 Once Oliver defeats him the story catches up to season 1 and a surprise cameo from Moira Queen is seen. It’s a great scene that is played well by Susanna Thompson. Stephen Amell’s performance in this episode deserves special recognition as he plays so many different emotions wonderfully proving that he is a great leading man. I’ve loved this season of Arrow. The writers stripped it back to the fundamentals and rebuilt it from there to great success. This season had a great villain, excellent characterisation and a strong sense of identity. Even the flashbacks returned to being mostly watchable. If you ignore the final scene then this could have easily been the final episode of Arrow as it was structured in such a way that could have sent the season out on a high. It referenced everything that had come before, completed Oliver’s journey into being a Hero who has a strong sense of who he is and brought the flashbacks to a close so the series could have ended here with the suggestion that Oliver carries on with renewed confidence in himself and a different mission statement for him and his team. Of course there is going to be a sixth season so the show will continue but what does that look like now that many of the major arcs have been resolved? I don’t have many ideas but I would like to see the tone continue to lighten as time goes on. Oliver has less baggage weighing him down now so this could translate into a more positive attitude for him. It’s also entirely possible that Samantha could be one of the casualties from the multiple explosions which forces Oliver to learn what it means to be a father for William who has nobody else. Essentially his mission statement could be about preventing William from turning out like him. Apparently Katie Cassidy is rejoining the cast next season so could she be a less intense big bad for them or might she go down a redemptive arc? The show is essentially free to perform a soft reboot and become…something else. I’ll be back for season 6 so anyone who enjoys reading my ramblings on this show I hope you’ll return to my reviews.